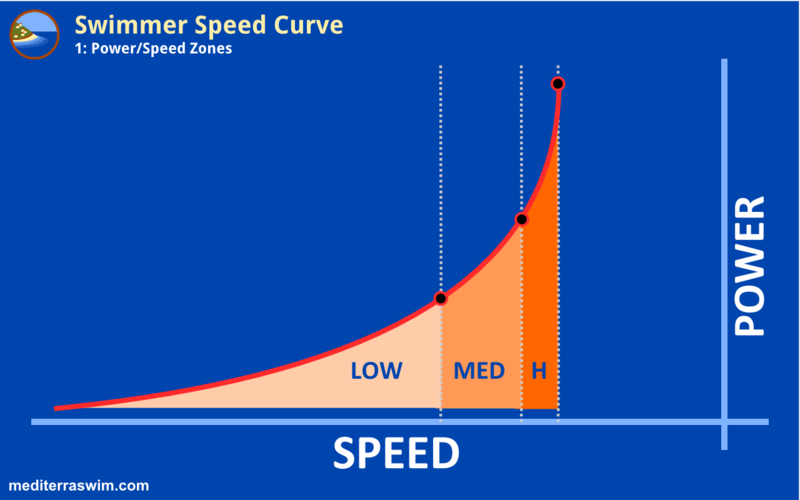 Swimmer Speed Curve – Part 4 | Mediterra - Swim & Run Better Than Ever! Maintaining best form when energy is abundant is a great Level 1 accomplishment. That is really a good functional goal for recreational swimming, and that may be as far as some want to go – those who don’t intend to swim under any sort of metabolically stressful conditions (think ‘getting tired’ in open water, long distance, racing, etc). But if one intends to swim with good form (shape) under stressful conditions then he must train to hold good form under those conditions. 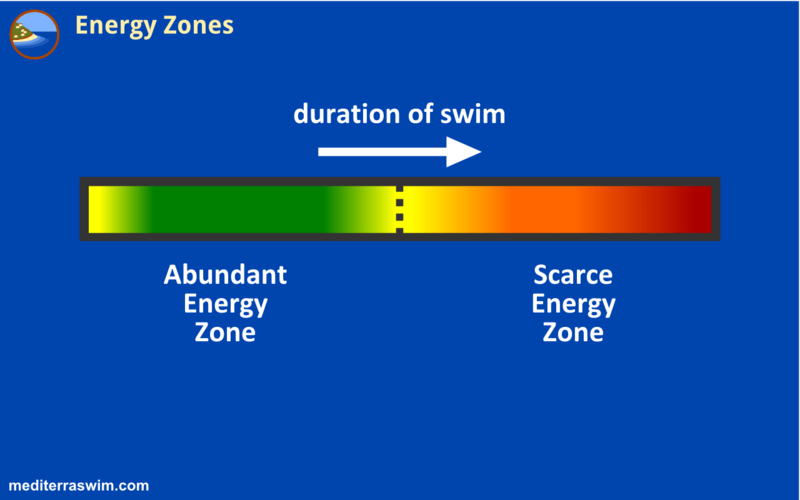 Let’s divide a swim into two zones – the Abundant Energy Zone and the Scarce Energy Zone. It is challenging at first to develop superior form for the first time – while in that private lesson or workshop we may have an abundance of physical energy but the brain is really taxed while building new motor circuits for these new body positions and movement patterns. Eventually, those get ‘hard-wired’ into the brain (automation) and one can keep working on them for hours with relatively low physical energy demand. To make it easiest to build those new circuits for the first time our learning method deliberately limits swimmers to working within the Abundant Energy Zone. When energy gets scarce the brain and body will compete for the diminishing energy – often the old physical patterns take over again and are reinforced, while the new patterns are neglected. Once a swimmer can consistently apply his stroke skills to swimming any distance or speed within his Abundant Energy Zone we may regard that as a good Level 1 success. It is a fact that many people are content to stop progress there, for many good reasons. They simply don’t want to drain all their energy in a swim practice – they have other things to do with their excess energy that day. However, many others are not content to stop progress there because their intentions for swimming, their performance goals require more. Those goals will require the swimmer to enter the Scarce Energy Zone and that’s tough swimming, good technique or not. The only way to improve performance in that zone is to train in it. Swimming in the Scarce Energy Zone is uncomfortable for everyone. But one’s training determines how much discomfort he feels. When he trains for physical efficiency he experiences less physical discomfort. When he trains for mindfulness he experiences less mental discomfort. When one starts entering into the Scarce Energy Zone some deeper probing of skills will happen and weaknesses will be exposed – weaknesses that were not seen, or perhaps were easily tolerated with low consequence when energy was abundant. When energy is scarce, one is forced to strip down the stroke even further to essential position and movement patterns to preserve and extend what energy is left. It is in this zone that one really learns which details waste energy and which preserve it, which details enable him to get more work done for less expense. While Total Immersion training in Level 1 is meant to extend your duration in the Abundant Energy Zone (you can swim further and faster than you imagined with those fundamental skills), Level 2 training is meant to extend your duration in the Scarce Energy Zone. Level 1 training will extend your Abundant Energy Zone, allowing you to swim there longer than before. 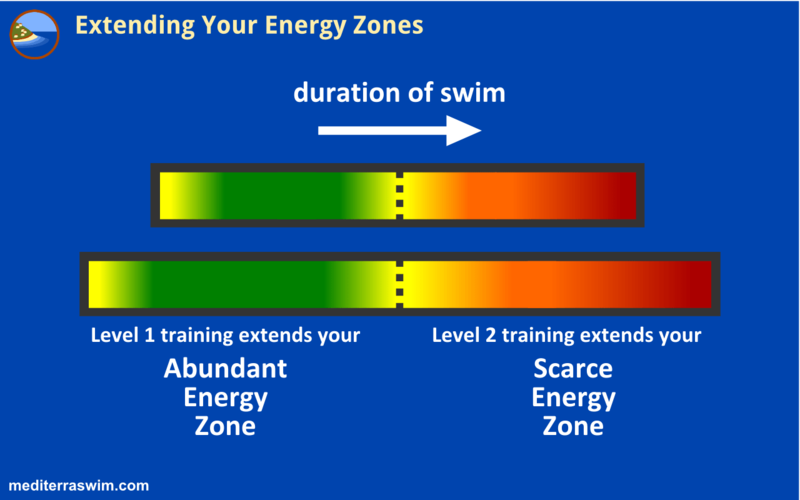 Level 2 training will extend your Scarce Energy Zone, allowing you to swim there longer than before. Now, add the two together and you get a swimmer who can swim faster, for longer distances, as he pleases. Improvement in one zone supports your improvement in the other. By working smarter in the Abundant Energy Zone you delay your arrival to the Scarce Energy Zone. Working smarter in the Scarce Energy Zone makes you even more sensitive to energy conservation when energy is abundant, which extends your energy further. That’s the difference between these two scenarios with the higher curve to the right and the higher curve to the left. In both scenarios the swimmer can achieve Easy Speed, while energy is abundant and power is low. 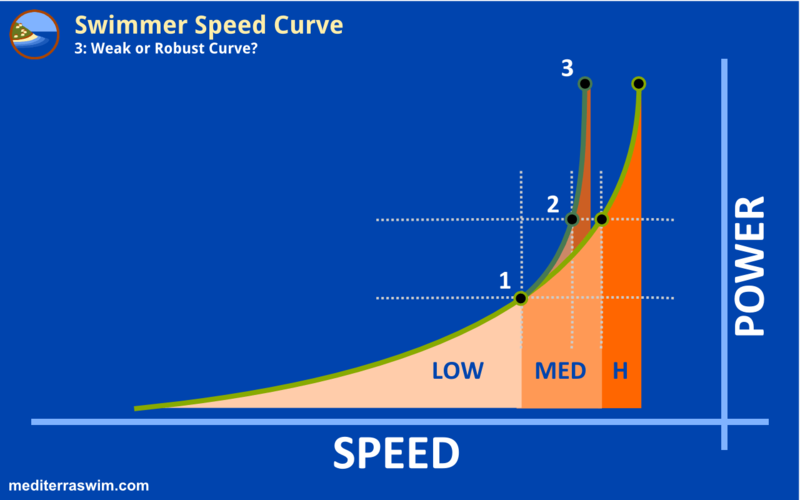 But after that, an accomplished Level 2 swimmer can produce Smart Speed and will follow the curve to the right. This is the result he experiences from the Efficient Speed training process. A Level 1 swimmer will curve to the left because she is lacking in those resilient stroke skills. She is just beginning the Efficient Speed training process – it takes time and does not come by magic just because she can achieve Easy Speed. This is the difference between one who has trained to hold attention on the energy saving priorities under stress and protect them at all costs (literally) while the other has not trained at that level sufficiently. Work in the low power zone to build new or rebuild better neuro-muscular control, and do mindful repetitions in a variety of conditions to memorize and aut0mate those skills. Then work in the medium power zone to strengthen them. Then work in the high power zone to stretch them further. If you are working hard on Level 1 to achieve that Easy Speed, good job, keep going. That is essential work. And if you think you are ready for Level 2, Smart Speed, understand that you need to train now under increasingly challenging conditions, and you need to keep clear in your mind what the training priorities are to be as it gets tougher – that’s what will make you a Smart Speed Swimmer. – What “internal variables” will show me, my individual curve is opening to the right? Or have the internals be mixed with outer objective measurements, SPL-Pace-TT settings? – Kaizen states continues improvement. I’d advocate it as internal measurement (we feel as a better swimmer when leaving the pool…) but external measurements mostly seem to improve in steps which may push our feeling a step up too. Hi Werner, maybe this was just for you and a few thousand other swimmers out there. You are one human among many who are trying to master an unnatural activity. I will need to work on an essay to describe subjective, internal indicators, but I have referenced those things in previous articles: ‘easier to do same amount of work’ ‘smoother flow of force through the body’ ‘feels and looks faster’ ‘feels more slippery’ ‘actions are more precise. These are subjective – measured by your own internal sensory equipment, and they are relative – a comparison of how it feels/looks right now to how it felt a moment, a day, a week before. We can describe a general discomfort but this is also a very personal, subjective thing. Again, your best approach is to start the increased challenge activity, note the type and level of discomfort and then take note of how the training process reduces this discomfort. When you find yourself actually looking forward to the stress you know you’ve crossed a line where discomfort is no longer regarded as suffering but a positive association with transformation – a transcendence. But that is poking into the metaphysical side of all this. But we can use some objective data to give you some sense of what you can expect of yourself in your context of age, background, physical condition, etc. Then you combine this with external measurements and internal measurements to indicate where you are on your graph working toward your personal goal. And that goal is not just in terms of how fast/far you swim. Consider the way you want to feel when you finish a good practice or a long swim – that is the vision you are training toward, those are the sensations you want to train into your system.